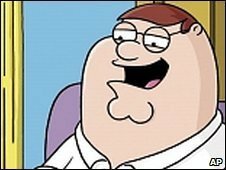 A County Tyrone councillor's alleged resemblance to Family Guy character Peter Griffin could soon be appearing on election posters. 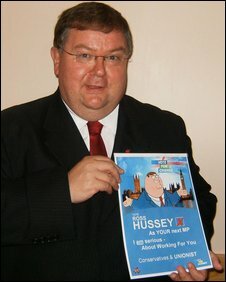 Omagh councillor Ross Hussey said he was told about his cartoon lookalike by his nephew and a young party colleague. The Ulster Unionist said he was not flattered but it did amuse him. "Personally I can see no resemblance, but I have watched it and we would have certain similar traits - that's all I'm prepared to admit to," he said. "To be perfectly honest, I didn't know who this Peter Griffin was until my 23-year-old nephew and young Ryan who works here pointed out a resemblance." Mr Hussey said they would have to wait and see if the poster was approved by his party. Peter Griffin was elected to his son's school board. "Really it's a bit of fun, and anything that could get young people interested in politics is good. "If they can see that we are human and realise that we're not all God's gift, why not? There's enough serious things out there without adding to the worries of the world." Mr Hussey's doppelganger has successfully run for office in the cult US comedy, defeating his wife Lois in a contest to become school board President. Lois was also elected mayor in an episode titled It Takes a Village Idiot, and I Married One.